Sandwiched between Narfell and Thesk, the Great Dale is considered a vast wilderness by most. The land is speckled with lonely farmsteads and clanholds, guarded by druids and rangers who enjoy their solitude and protect their homes with a vengeance. Few foreigners have reason to journey to the Great Dale, and that's just how its inhabitants like it. Narfell and Damara bound the Great Dale to the north, Impiltur and the Easting Reach to the west, Thesk to the south, and Rashemen to the east. While a decent road runs the length of the country (if it can be called that) between the Rawlinswood and the Forest of Lethyr, it is not a major trade route. There are few stops along the way, and the residents of the Great Dale show so little hospitality to strangers that a popular joke is "There's no room in the dale!" The land here was once part of the ancient Empire of Narfell, although it was originally settled by folk from Jhaamdath. When Narfell and Raumathar destroyed each other 1,500 years ago, the Great Dale was decimated in the fighting and lay virtually empty and wild for centuries. The land is now a frontier for the populous kingdom of Impiltur to the west. For generations, Impilturans in search of land and independence have been trickling eastward, carving out homes from the Dale's wide-open spaces. Including the great forests that flank the dale itself, the Great Dale extends from the western end of the Rawlinswood to the shores of Lake Ashane, a little more than 400 miles from past to west. North to south, the land runs from the north side of the Rawlinswood down through the Forest of Lethyr to just shy of the River Flam, just over 300 miles. In all this vast territory lives a human population numbering little more than that of a single great city in other lands, and most of that is concentrated at the western end of the dale in Uthmere and the surrounding countryside. There are few settlements in the central or eastern reaches of the Great Dale, and most people in those regions live at least a hard day's ride from their nearest neighbor. Most of the land between the forests consists of rolling downs, a seemingly endless series of low, heather-grown ridges steadily climbing as one travels from west to east. The soil is thin and rocky in most spots, and few crops grow well at higher altitudes. Long ago, ancient glaciers gouged this land deeply, leaving behind long, snaking moraines and countless tiny lakes, but scraped the best soil into the low plains near the Easting Reach and the Forest of Lethyr. The folk of the eastern dale are mostly goatherds and shepherds, not farmers. The Great Dale's climate is tempered by the proximity of the Easting Reach, but winters are harsh, while summers are comparatively cool. The Forest of Lethyr is a mix of coniferous and deciduous forest, but the Rawlinswood is a true taiga, a northern pine forest with bitterly cold winters and cool, mosquito-plagued summers. The two defining features of the Great Dale are the massive forests that bound it to either side. 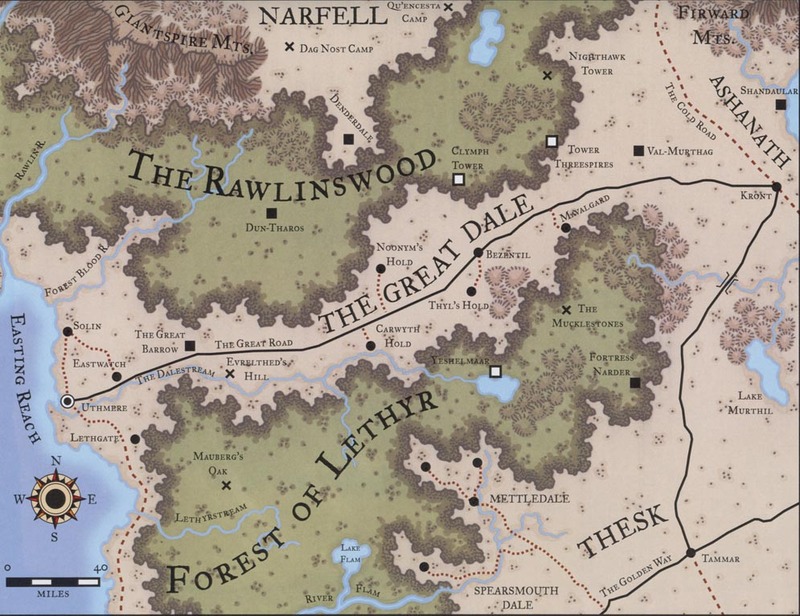 The Rawlinswood runs to the north of the dale from which the land gets its name, and the Forest of Lethyr borders the south. The dale climbs steadily from west to east, reaching an elevation of nearly 2,000 feet above sea level at Ashanath. The most prominent feature of the Great Dale is this long, windswept gap between the Forest of Lethyr and the Rawlinswood. When the world was young, some arm of the Great Glacier scoured a path between two slightly higher stretches of land, and since that long-ago time, the great forests have been unable to take root in the vale between. The Dalesfolk tell other stories to explain the gap; some say a great dragon burned a path through one great forest, while others claim that Shaundakul and Silvanus held a contest to determine whether wood or wind would rule this land, and that Auril the Frostmaiden intervened to set winter over both. Whatever its origin, the gap averages forty to sixty miles in width and stretches nearly 250 miles in length. (The region known as the Great Dale includes the two forests and is quite a bit larger than the dale itself.) Rumpled ridges of bare rock rise from its thin soil, growing steeper and more rugged toward the forests that flank north and south. In sheltered spots, the topsoil is thick and fertile, but most of the land is suited only for raising hardy livestock such as goats and sheep. Most of the people of the Great Dale live in the western reaches of the land, near Uthmere. As one travels east, settlements become fewer and farther between; most folk live on the edge of the two major forests or just inside their eaves. The canopy of the trees is so thick, even in the heart of winter, that almost no light passes through, casting vast portions of the land in twilight even at the height of the day. While this also provides for shelter from the rains, sun, and snows, it makes for poor farming. A long road - the only well-traveled one in the territory - runs from Uthmere all the way to the Cold Road in the east. Technically called the Great Road, it is known by many names throughout the region, but most of the area's residents just refer to it as "the Road." Since there aren't any other major roads, it's clear which one is meant. The dale is known for its fierce winter winds. Those farms and settlements not sheltered by the woodlands are scoured by harsh west winds that blow down the length of the gap as if Shaundakul himself were racing along the Great Road. About seventy miles up the Great Road from Uthmere looms the Great Barrow, a vast dark mound. A number of lesser barrows ring it like cold sentinels, the long brown grasses of their rounded sides hissing endlessly in a chill north wind that never dies away completely. No one knows who is interred in the Great Barrow, or what forgotten people raised it, but stories say that a cruel human tribe once roamed these lands before even the rise of Narfell, and that their god-born champion lies buried here. Naturally, the place is said to be haunted by restless spirits. A century ago, an Impilturan lord named Elphras mocked the old stories and raised a small stone keep on a nearby hill, claiming the barrowfield along with the land for miles about. Some unknown catastrophe overtook Elphras and his entire household, for the Impilturan lord, his family, and a keep full of guards and servants disappeared one cold night, leaving behind an empty and cheerless tower. North and east of Bezentd lies the wreckage of the old fortress of Val-Murthag, one of the largest Nar ruins not covered by forest. This great castle stood watch over the eastern approaches of the Dale, a formidable rampart in the path of any attack from Raumathar to the east. Val-Murthag was a place of madness and horror, the spiritual center of the demonic cult that dominated the dark empire's final days, and Raumathari battlemages visited untold destruction on the place in the final battle of the two realms. Little of Val-Murthag remains to be seen, except for sprawling old walls of weathered black stone that run for miles across the cold downs and the shattered stumps of watchtowers amid heaps of battered stone. The ghosts of Nar demonpriests are said to haunt the ruins, and most of the Dalesfolk give the place a wide berth. At the northeastern end of the Rawlinswood, hard by Lake Ashane, stand the Firward Mountains. This range lies midway between the Giantspires of Narfell and the northern Sunrise Mountains of Rashemen. The Firwards are unlike the forbidding ranges of the neighboring lands. Relatively low, they are densely forested to their summits and unusually cold and snowy in wintertime. Narfell, Rashemen, and the Great Dale all could claim the Firwards, but the mountains rise between the least populous portions of all three countries, so they form an uncontested border between them. Even in the days of ancient Narfell, the Firwards were not heavily populated, although some of the kingdom's more powerful archsummoners raised demon-built fortresses in their cold isolation. These days, the Firwards are home to the Horned Skulls (a large, fierce tribe of bugbears), bands of frost giants, and several clans of vicious taers. Beneath their frozen peaks lie the delvings of a handful of shield dwarf clans, and below those, extensive Underdark caverns dominated by demon trolls. The Forest of Lethyr occupies the southern half of the Great Dale and is a natural boundary between that land and Thesk. The portion of the forest south of the River Flam is considered Theskian land. The residents of the Great Dale hardly notice. Thir area has been constantly logged over the years, making it the poor cousin of the northern reaches. Close to the Golden Way, these lands are too near civilization for comfort in the minds of druids and rangers. The Forest of Lethyr is home to the Nentyarch (N male human Drdl7/Hie5/Sor6), the most powerful druid in northeastern Faerûn. The Nentyarch leads the Circle of Leth and their agents, the Nentyar hunters. From his seat at Yeshelmaar, the Nentyarch and the druids who serve him defend the forest against wanton cutting and over-settlement. The Nentyarch is also the master of the Rawlinswood, but two years ago the frenzied hordes of the Rotting Man stormed Dun-Tharos, his former seat of power, and drove the Circle of Leth to the southern forest. Separated by the sparsely populated valley of the Great Dale, these two opposing forces are engaged in a mortal struggle. for both woodlands. The Forest of Lethyr is filled with all sorts of creatures, but the most prominent ones are the treants who work with their humanoid friends to protect the woods. Lethyr is also home to several villages of secretive wood elves, as well as a handful of volodni bands. Human settlements are limited to the forest's southern edges. Spearsmouth Dale is nestled on the edges of the treeless valley closest to the source of the Flam. The next valley to the northeast along the forest's edge is home to Mettledale. Like Clymph Tower in the Rawlinswood, this ruin in the Forest of Lethyr is twisted and evil. Some buried taint of ancient Narfell lurks in the dungeons beneath the ivy-grown stones; poisoning the groundwater and sickening the trees and forest creatures of the surrounding area. While it is tempting to blame this baleful influence on the Talontar blightlords of the Rawlinswood, the evil here is different: Its foulness is not Talona's blight - in fact, the Rotting Man is keenly interested in the mystery of Fortress Narder and sends parties of blightlords here, hoping to unearth something from its horrible dungeons. Under the direction of the Nentyarch, the Circle of Leth is calling treants to move the remaining healthy trees to safer parts of the forest. Then the druids plan to quarantine the area and destroy the corrupted flora and fauna. This will create a hole in the heart of the forest, but in time the wound should heal over. If the druids have anything to say about it, none but they and the Nentyar hunters will know there was anything wrong here. In the meantime, monstrous creatures spawned in Fortress Narder's dungeons creep out to hunt and slay in the forest nearby, delaying the druids' plans. The Nentyarch fears that simply quarantining the ruins may not be enough. He may have to find someone to uncover the source of the horrible evil and destroy it once and for all. Mauberg's Oak is a huge tree located in the northwestern reach of the Forest of Lethyr, about a hundred miles southeast of Uthmere. The tree measures 50 feet in diameter at its base and stands over 300 feet tall, towering over the canopy of the forest around it. Its branches shade a vast area, and its leaves are thick and green all year round, even in the dead of the harshest winters. Although still living, the tree was long ago hollowed out by the powerful druid Mauberg. He magically worked the wood to build a massive tower hideaway in the heart of the amazing tree. Although Mauberg has been dead for over a century, his legacy lives on. He crafted the oak to house a school for young druids and to display the awesome power of nature. The tower features almost a dozen levels on the inside of the tree and extends below the soil for three more levels. The school's headmaster, a Theskian woman known as Qakandra (NG female human Drdl3) is wary of strangers, even new applicants. Only those who prove their dedication to nature by passing various tests, both magical and mundane, are allowed to enter the tree itself. Others are permitted to sleep under the eaves of the oak if they are of either good or neutral alignment. Evil visitors are run off immediately. A large colony of treants lives under the oak's canopy. They provide Oakandra with an early warning system against incoming threats. A dozen aarakocras live in the upper branches of the tree, watching the skies for danger from above. The leader of this group, Chir'kawta (NG male aarakocra Drdl2), is a powerful druid who once studied here under Oakandra herself. This ancient druidic holy site is located in the northeastern Forest of Lethyr. Its unusual clearing features no tree trunk but is protected from the sky by the bordering trees, which meet over the center of the open space. Within this space stand a number of weathered stones about 6 feet in height, 4 feet across, and 2 feet thick. Their surfaces are covered with nature-runes. The stones form an elaborate arrangement that shifts from time to time, as the stones occasionally move about. Elder druids who have tracked the progression of the Mucklestones over the years claim that sometimes the entire clearing moves, taking the stones along with it. It never moves very far, though, and the druids have always been able to track it down. Each of the Mucklestones is a portal to a different part of Faerûn. The nature-runes on a given stone indicate where it leads, but they are difficult to puzzle out - they are carved in an ancient dialect of the Druidic tongue (Decipher Script check DC 30 or knowledge of the secret language of druids). Some of the runes have faded over the years, miking it impossible to know where the portal might lead. At least one of these portals connects to the Sunglade deep in the Yuirwood (see Aglarond). The druids of this area sometimes use it to meet with the Masters of the Yuirwood, and sometimes they bring along young rangers who wish to study with the foresters of those elder woods. The Mucklestones aren't the property of any person or group. Still, the Circle of Leth guards the area jealously for fear that evil creatures might locate the stones and destroy them. A high druid named Briartan (LN male human Drd13) lives nearby, and he coordinates the efforts of his fellows to keep the Mucklestones safe. These people sometimes call themselves "the Mucklefriends," but rarely in the company of strangers. Not far from the crossroads of Bezentil, near the center of the Great Dale, a great rocky tor rises from the forest. A pristine lake of clear, cold water stands at its foot. Carved into the tor is an old wood-elf stronghold known as Yeshelmaar, built in the days when the Lethyr elves faced destruction at the hands of the sinister Empire. of Narfell to the north. The threat of old Narfell has long since passed away, but so too have most of the elven folk. Of the wood elves who once lived here, only a few small villages survive. The old elven stronghold has become the new fortress of the Circle of Leth. The Nentyarch and his High Druids formerly inhabited Dun-Tharos in the Rawlinswood, but two years ago they were driven out by the Talontar blightlords, and Yeshelmaar became the Nentyarch's seat-in-exile. Yeshelmaar is the informal capital of the Great Dale, or at least its eastern half. The folk of the lonely clanholds hold a deep reverence for the Nentyarch. At. any given time, a dozen druids of various ranks and twice that number of rangers, hunters, and foresters occupy the stronghold or the woods nearby, along with a handful of Dalesfolk come to seek advice or assistance. The Nentyarch is occupied in a fierce contest against Talona's Rotting Man for the very soul of two great forests, but his druids do what they can to help out the Dalesfolk and shield them from the worst of the blight- lords' depredations. The Rawlinswood forms the northern border of the Great Dale, weaving its way south of the Giantspire Mountains and the plains of Narfell until it peters out near the Cold Road and the Firward Mountains. Once, the Rawlinswood was a northern twin to the Forest of Lethyr, but a horrid evil has clawed its way out of the black earth, poisoning the Rawlinswood and filling its green gloom with blood, disease, and madness. The sinister Rotting Man (NE male half-fiend human druid 12/Talontar blightlord 10, Chosen of Talona) leads a dark circle of evil clerics and druids devoted to the Lady of Poison and, through these blightlords, a growing host of blightspawned volodni warriors that menace all the nearby lands. The Rawlinswood is a mixture of deciduous and evergreen trees along its southern border but quickly becomes a soggy taiga as one travels north from the Dale. Treacherous muskeg bogs fester above a deep layer of permafrost, giving rise to clouds of mosquitoes in the Rawlinwsood's short summer. In its northwestern reaches, the forest climbs sharply toward the Giantspire Mountains, covering rugged foothills and deep, shadowed vales. Like all the Great Dale, it also rises toward the east, and its easternmost reaches are quite hilly. The forest narrows to a narrow band only twenty-five miles wide about two-thirds of the way along its length, moving from west to east. The now-abandoned settlement of Denderdale is located here along the northern edge, almost enclosed by the reaching arms of the forest. This is the best place to try cutting through the forest. The way isn't long, comparatively, and those who are eloquent or desperate enough may be able to hire a guide to take them to the south side of the forest or back. Just to the northwest of the forest is the Damaran settlement of Tellerth, hard by the Long Road. For years, the Circle of Leth worked to stop the encroachment of Damaran and Impilturan loggers into the western reaches of the Rawlinswood, but the Nentyarch's followers have been driven into the Forest of Lethyr and no longer patrol this area. The humans now face the Rotting Man and his rising tide of evil. Once the capital of the ancient Empire of Narfell, Dun-Tharos sprawls for miles through the pines and hogs at the heart of the Rawlinswood. From this place, the Nentyarchs (as the rulers of ancient Narfell were known) ruled a great and terrible realm of dark keeps and proud, sinister lords. Dun-Tharos was laid waste in the final cataclysmic war between Raumathar and Narfell, the entire city leveled by some mighty spell of unspeakable power. So ended the Nentyarchs and their demon-haunted kingdom. Centuries passed, and the forest grew over the great black scar in its heart. A group of druids and rangers - the Circle of Leth - undertook the work of healing the wounded land, Their leader took the title of Nentyarch anew to signify that the druids of Leth ruled over the heart of ancient Narfell. In the ruins of Dun-Tharos, the new Nentyarchs raised a fortress to govern the great forest. The black keep of the old demonpriests was reborn as a castle of living trees, woven by druidic magic. From this forest-castle the Nentyarchs ruled for nearly six hundred years, preserving the Forest of Lethyr and the Rawlinswood from encroachment by human kingdoms on all sides. The ruins of the old Nar capital reminded the druids of humanity's ability to harm nature, and the forest that had swallowed its black stones offered an example of what might be accomplished with patience and strength. All things come to an end, though. Ten years ago, the Rotting Man, Chosen of Talona, began to gather a circle of dark druids in the western reaches of the Rawlinswood. The Circle of Leth fought against the rising power of the blightlords and contained the Rotting Man in the west, but two years ago the Rotting Man created a terrible new weapon to use against the Nentyarch - the blight of Talona. He corrupted a handful of captured Leth druids, changing them into blightlords who serve him. Through these tortured minions, he ensnared hundreds of volodnis and infected them with Talona's blight. At Midwinter in 1371 DR. he hurled his blightspawned army at the Nentyarch's fortress and drove the Circle of Leth out of the Rawlinswood. Dun-Tharos is still a castle of trees, but they are now dead, animated through the Rotting Man's foul sorcery. Hundreds of his minions lurk in the ruins of Narfell's old capital, ready to surge forth and slay at his command. His blightspawned warriors slaughtered the small community of Denderdale, north of the forest, only two months ago, and bands of evil volodnis harry the clanholds and farmsteads south of his forest. Dun-Tharos has become a place of death and madness once again. Once a proud, walled keep, Clymph Tower has lain in ruins for as long as anyone can remember. A mighty sorcerer named Clymph built the place nearly five hundred years ago. Clymph is also believed to have constructed Tower Threespires, for the two sites have a similar architecture and were built around the same time. Clymph Tower has remained untouched for decades, though, and the locals believe it is cursed for some transgression of its fabled builder against the gods. The best story - or at least the one that gets repeated the most - is that Clymph was a powerful demonbinder, a student of the forbidden arts of ancient Narfell. He dreamed of forging a kingdom in the Great Dale with his demonic armies. He constructed this keep as a pen for his foul servants and imbued its very stones with abjurative magic, transforming the perimeter of the building into a massive magic circle. He then created a permanent gate directly into the Abyss. Unfortunately, Clymph was unable to control the demonic hordes he summoned, and his fiendish minions destroyed him. However, he had crafted his demon-trap so well that the fiends could not escape except through one portal leading to Tower Threespires, and that door is sealed. Dozens, perhaps hundreds, of demons are still trapped in the fell tower Clymph raised centuries ago. Today, those few people who dare to approach the ruins report that its stones glow red with heat and that massive fire crackle from the depths. Even the most daring adventurers give the place a wide berth. The legendary Clymph reputedly built this tower as well. Three stone spires stab out of its broad base. It would have fallen over years ago if not for the thick network of vines that wrap around every inch of the place. If the vines were to wither and die, the tower would come down along with them. From a distance, the vine-engulfed tower looks like nothing so much as a giant, three-fingered hand reaching up out of the Rawlinswood. The tower is maintained by a small group of druids who are the descendants of a special order of guardians created by the Nentyarch hundreds of years ago. The peak of the north tower features a portal that leads right into the heart of Clymph Tower. The druids perform a ritual every Feast of the Moon to keep the portal sealed up tight, preventing the demons trapped therein from escaping into the world. The druids who perform the ritual are no longer certain if the legends about the demons of Clymph Tower are true, but they hold to their appointed task. The druids of Tower Threespires are suspicious of strangers. They never allow anyone into the tower, no matter how dire the need, for fear of opening the portal and unleashing the demons of the Abyss on the Great Dale. Brave souls who skirt the Narfell edge of the Rawlinswood on their way east and south toward more welcoming lands eventually come to Nighthawk Tower. City dwellers may not immediately recognize it, since it's actually a mighty oak tree - about 100 feet tall - the branches of which are filled with platforms constructed with sturdy rope and rough-hewn wood. Nighthawk Tower is the home of Hensoi (NG male human Drd12 of Silvanus), who has a reputation - deserved or not - as the friendliest druid in the Great Dale. In other words, he doesn't hide at the first sight of other people, nor does he run off visitors before they've had a chance to speak. Hensoi is fond of the region's birds, and at times the boughs of Nighthawk Tower seem like a giant aviary. The local raptors often rest here. Hensoi isn't outgoing, but he is willing to talk to strangers, which is more than most druids in the area do. Underneath his gruff exterior, he's softhearted. When presented with good people who need his help, he grudgingly agrees to do what h can, although he complains about it the entire time. When confronted with evil, Hensoi sends his avian friends high into the sky to screech for help. The druids and rangers in the region recognize the signal, and when they see it, they dash for the tower to offer their help. The locals may think Hensoi a bit too free with strangers, but he's one of them, and they won't let him come to harm.